like a well-watered garden, like a spring whose waters never fail. The purpose of the Labyrinth Ministry Team is to maintain and promote use of our labyrinth, A Place Of Grace. We also accept special prayer requests. Our current team includes: Peggy & Dennis Buckless, Sharon Carletti, Nancy Fox, Cathy Jacobs, Gina McCall, Claire Miller, Betty Murphy, and Lisa Duerling, Chair. If, after reading through the below information, you are interested in becoming a part of this ministry, please contact Lisa Duerling at 410.615.8640, or speak to any team member at church. We welcome you and your ideas and suggestions and we encourage you, your family and friends to take advantage of this beautiful space; after all it is right in our own backyard! On behalf of Pastor Lesley M. Radius and the Labyrinth Ministry Team, we welcome you to come, see, walk, and find peace! A gathering service to remember and honor the precious lives lost during the tragic attacks against the United States on September 11, 2001. A total of 2,977 people were killed in New York City, Washington, DC and outside of Shanksville, PA. More than 6,000 others were injured. Participants explored together closer communication with the Lord and learned how to heal with meditation and reflection, experienced walking in prayer, learned breathing and centering techniques, and prayed using scriptures. ​During varying times throughout the Sunday School year, many of our younger children participated in learning about the labyrinth and then walked it with their teachers. Did you know there is a World Labyrinth Day? Yes, this special day is a year away but the Labyrinth Ministry Team is already beginning to make plans for the day. World Labyrinth Day is held the first Saturday in May and is commonly referred to as “Walk as One at 1 Day.” Over 5,000 people in at least 35 countries celebrated the 10th Annual World Labyrinth Day in 2018 by walking their respective labyrinths at 1:00 o’clock in the afternoon. The Labyrinth Society, promoter of this event, has set a goal to have 50 countries and all 50 USA states represented in 2019! Please remember to check our website in early 2019 for more information and details about our plans to Walk as One at 1 on May 4, 2019! In the fall of 2016, we received a request from two mathematics experts [David Thompson and Diana Cheng] to visit the labyrinth and explore its use in the development of a mathematical project and for conducting a workshop for school children on the mathematics of labyrinths at the 2016 Joint Mathematics Meeting. David Thompson is a high school math teacher at Digital Harbor High School in Baltimore City and Diana Cheng is an assistant professor of mathematics at Towson University. Photographs and figures for this project were completed by Robert Burgee and Rebecca Butcher. The final project was published in MATHEMATICS TEACHER, Vol. 110, No. 4 – November 2016. Help & Donations are Always Welcomed! There is a continuous need for upkeep of the labyrinth pathways and surrounding gardens and area. If you would like to help, please contact Lisa Duerling at 410.615.8640, lisa.duerling@homesbyriley.com, or call the Church Office at 410.665.1234. This is a great opportunity for middle and high school youth to earn community service hours! If you know of any student who needs hours and enjoys working outside, please tell them about it and share our contact information! And, it goes without saying that we always welcome donations of perennial flowers, plants and/or ornamental grasses for our two main gardens. Please keep this need in mind when thinning out your gardens or shopping for new additions to your gardens. ​St. John’s Lutheran Church, a pillar in the Parkville community for over 125 years and located at 8808 Harford Road, completed construction of its labyrinth in the summer of 2013. 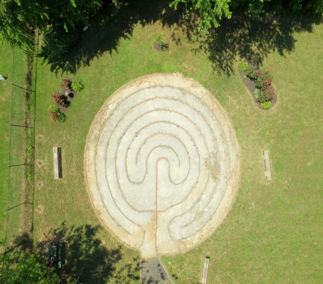 The labyrinth was officially dedicated and opened for use in October, 2013. Ample parking is available on our church parking lot. 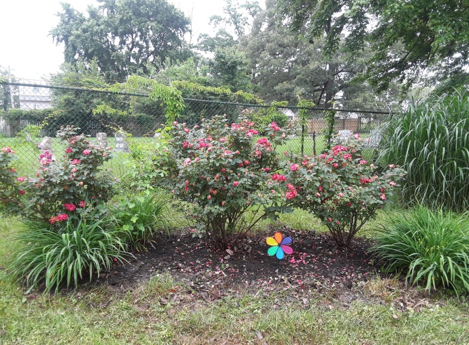 All are welcome to use our labyrinth during daylight hours. Our labyrinth is listed on the web, under The Labyrinth Society’s World Wide Labyrinth Locator, https://labyrinthlocator.com. Feel free to explore this site for information on other labyrinths in our immediate area and in other areas around the world! What exactly is a labryrinth? A labyrinth is an ancient resource to help people center their lives and become open to God’s presence and voice. Original labyrinths have been in existence for over 4,000 years and predate Christianity. Christians began using labyrinths in churches and cathedrals in The Middle Ages. Labyrinths are usually single pathways that lead to the center of the pattern and then back out by retracing the same path. Unlike a maze, one cannot become lost or trapped in a labyrinth. Our labyrinth is of a more simple design based on the Traditional Classic Seven-Path. The labyrinth area is a 48-foot diameter circle; all paths within this circle are 34 inches in width – specifically designed to accommodate the wheelchair dependent and those with mobility limitations. What is a labyrinth used for? The labyrinth is a path for prayer, reflection and meditation. It invites the walker to set aside the cares of our busy world and to enter into A Place Of Grace. 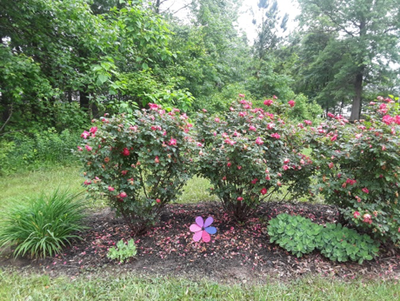 It is a quiet, peaceful setting outside the four walls of a church. All are welcome to use our labyrinth…from our St. John’s members – including our youth and younger children – to individuals and their families, other churches and small groups in the surrounding Parkville community. Walking the labyrinth allows you to discover something about yourself and God; it mirrors the twists and turns in life. The best way to learn about it is to walk it – with an open heart and an open mind. There is no right or wrong way to walk the path. Just relax and enjoy the experience. If you haven’t already done so, give it a try. You may be surprised at how empowered you feel after your walk! There are many ways to use the labyrinth for prayer. Here are a few suggestions for you to consider and use: Walking Prayer of Letting Go; Walking Prayer of Healing; Contemplative Prayer; and Meditation. A brochure is available at the labyrinth for those interested in these prayer techniques. Large print brochures are also available for your convenience. Look for the Info Box™ attached to the sign post at the labyrinth’s entrance. circumstances; for this is the will of God in Christ Jesus for you. As previously mentioned, the Labyrinth Ministry Team started a new prayer ministry in conjunction with promoting use of the labyrinth. 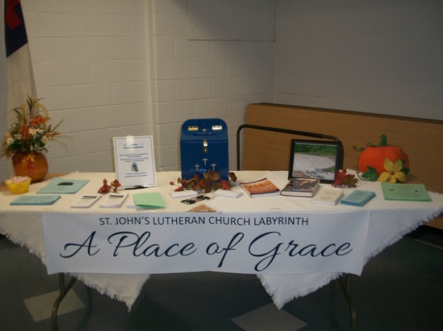 Our very own St. John’s member, Lou Carletti, made the beautiful blue Prayer Box for this new ministry. If you would like our team to pray for you and your needs, all you have to do is write them down on the index cards provided and drop them in the Prayer Box. The Prayer Box can be found in the hallway outside of church, along with index cards and pens! We collect these requests weekly and lift up you/your concerns in prayer to God during the month in which they were received. You do not have to provide your name or other personal information if it makes you uncomfortable. Prayer requests can be specific or general and anonymous. Feel free to place prayer requests in our Prayer Box as often as you like.